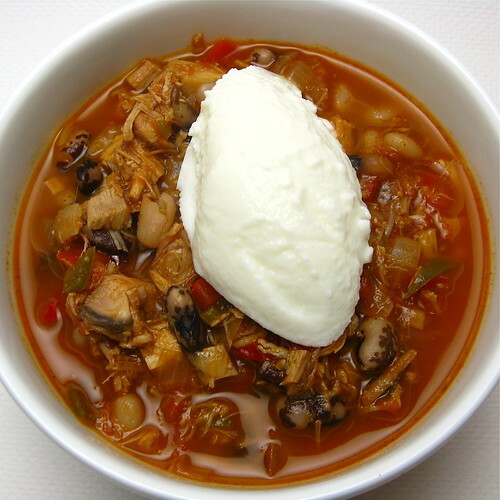 Chili is really one of our cold weather food staples. We often make a big pot for dinner on the weekend & then eat leftovers for lunch the rest of the week. The wonderful thing about chili is you really can play with whatever ingredients you have on hand. This one was made from some left over turkey meat we had in the freezer. We keep lots of different kinds of dried beans in our pantry & like to mix two together for color & taste (for this chili we used navy beans & Rancho Gordo Vaqueros, a favorite of ours for chili). We use our own canned tomatoes in this chili but love to use the Muir Glen Fired Roasted Tomatoes as well. Another favorite ingredient in our chili is beer, it just gives it that added something. This is another flavor you can really alter by using different types of beer from light to dark (We really like Sessions Black for making chili.). Topping can be whatever you like but my favorite is just a dollop of plain non-fat yogurt. It has less calories that sour cream but adds the same creaminess & tang (it also helps me cool things down when Matt adds a little too much spice to the chili for me!). Put the beans & 3 cups water in a large pot & bring to a boil. Boil for 2 minutes. Turn off heat, cover & let sit for one hour. Turn heat back on & bring to a simmer. Let simmer covered for about 1 - 1 1/2 hours. You want the beans to be tender but not mushy. I will try this recipe. I have never used ground turkey or ground chicken.....I am a purist when it comes to my once a year chili! Love the photo of the dollop! As for the chili -- looks fantastic. I might have to brew up a pot of my own... maybe when the nice weather clears and we have another one of those cold snaps! Rancho Gordo has some of the best beans! This looks like a fabulous chili recipe! I've never thought to add yogurt instead of sour cream. I'm going to have to try that next time! I love adding beer to chili, I am not always convinced I can taste the difference but there is still a placebo affect I think. I use yogourt instead of sour cream all the time! That looks really good. I am soaking some beans at the moment, but I haven't yet decided what I am going to do with them! A nice lighter touch on chilli without compromising flavour.